I love the style in Copenhagen. Pernille Teisbaek and Linda Tol once told me about the difference between Danish and Swedish style—there's something about the louder colours, playful combinations, bold prints and layering techniques that make the Danes look like they'd be at home on the coolest streets of Hackney Wick. These ladies are quite enchanting in their unexpected blend of sporty and romantic: You'll spot a street styler with acrylic pink hair clips, cowboy boots, a dress over jeans, a mad jacket and It bag all in one outfit, and it won't look as half as bonkers as it does on paper. The women we like to follow on Instagram (all below, for your double-tap ease), are experts with colour and accessories in particular: Barrettes are booming, and power pastels are filling up the pavements. Keep reading to see what Copenhagen's coolest are wearing for spring, because the fact is that everyone will want to adopt the looks, items and trends in a few months' time. 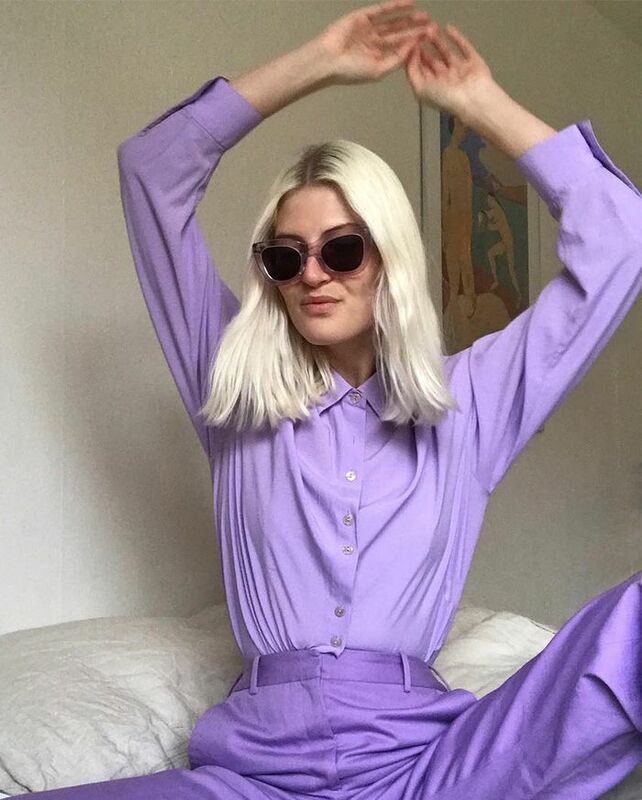 Style Notes: Anne knows just how to capture our attention: by wearing head-to-toe lilac and doing an interesting Instagram pose. Scandi girls aren't shying away from these saccharine hues, opting instead to wear them boldly on top of each other. Style Notes: Where Pernille leads others follow. So while L.A. ladies are into their teeny-tiny specs, we've noticed a real shift towards more '70s-inspired aviators over in Denmark and Sweden. Style Notes: Jeanette managed to pick up the rainbow version of these Attico sandals before they all sold out. Scandi girls are wearing these fancy heels in the most casual getups as well as with eveningwear—more versatile than you might have once thought. Style Notes: Julie's checked blazer and retro-look floral dress combo feels very London—but it's a double-print whammy that the Danes seem to be really into as well. Style Notes: Chanel bag preferences vary the world over, but we've noticed a particular trend for elaborate, cutesy versions in Denmark recently. Emili's outfit has a lot to be inspired by, but just take a peek at that gorgeous bouclé bag. Style Notes: When Danish girls aren't wearing sneaks or fancy strappy sandals, you'll be most likely to find them in cowboy boots. Hanna shows just how to wear them for now, with a little leg, a pretty skirt and a blazer—not Daisy Dukes. Style Notes: Marie's bow-tied Ganni sweater is just one of the many fluffy styles this brand is championing right now. Style Notes: Not entirely specific to this region, but definitely a thing in Danish fashion circles, Sarah heralded the arrival of the utility jumpsuit for spring 2018. Style Notes: Thora updates the Scandi-girl penchant for white shoes with the additional teal-blue metallic socks. Party time is calling. Style Notes: Trine is pictured here in an archetypal 2018 Danish ensemble of bold dress over jeans and worn with cowboy boots—especially white ones. And we love it. Style Notes: Katrine and a raft of other Scandi girls have been first onto this plastic hair clip trend—and yes, they do look really good with gold hoops. Style Notes: Laura's pushing this '80s silhouette into the future thanks to her tomboyish haircut and vinyl trousers. Style Notes: We've talked before about the colour combining skills of Marie, but even when she's spotted in one hue from head to toe, she looks just as cool. An orange suit with Chanel sneakers—why not? Anyone else suddenly want to do a city break?